Early last century, Vienna was home to some of the most avant-garde artists and architects in history. 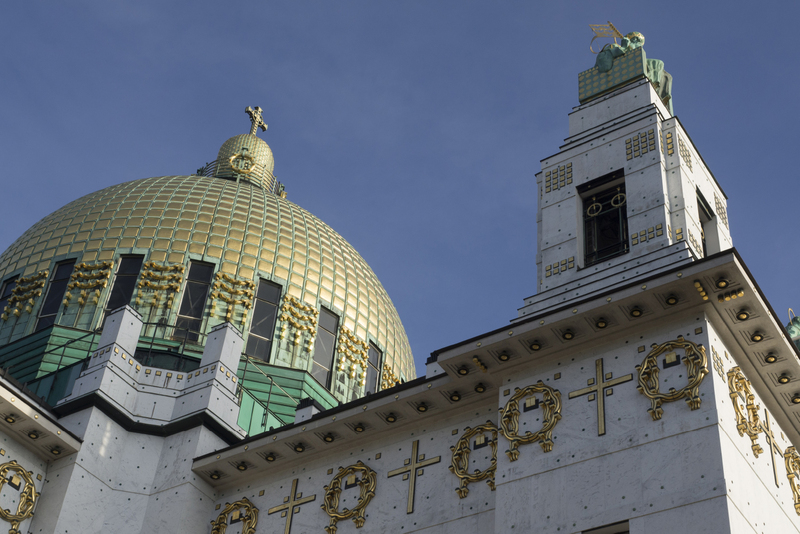 A hundred years since the deaths of four leading lights of Viennese Modernism, Imogen Eveson discovers the city is still celebrating this remarkable era. The shoebox-sized saloon is just 88 square metres but wall mirrors suggest it’s much bigger. The dim lights glow amber, and cigarette smoke hangs in the air. From ceiling to floor, bar to banquettes, everything is rendered in elegant materials: mahogany, marble, onyx and green leather. Sinking into a drink, I feel transported back a century. Only the strains of The Rolling Stones or Cream or something of that vintage scrambles the scene like a skipped record. The American Bar is largely unchanged since its days as the everyday haunt of the city’s fin-de-siècle movers, shakers and troublemakers, and it survives as a distillation of Viennese Modernism. Designed in 1908 by pioneering architect Adolf Loos and commonly known as Loosbar, it blends functionality and purposefulness with a beauty and atmosphere that gets under the skin. I wish for a moment that I could have drunk here back in Vienna’s golden age, but the next best way to see the Austrian capital is through postmodern eyes. To see in one glance – in everything from the Imperial Palace to galleries and boutique wine bars – the city’s arc in the last 150 years: from seat of the Austro-Hungarian Empire to cultural centre of Europe and from grand capital of a small republic to the world’s most liveable city. This year marks an important juncture in the story: it is 100 years since the First World War ended and the monarchy crumbled; and since four of Viennese Modernism’s key protagonists died, effectively spelling an end to one of the 20th century’s greatest artistic movements. 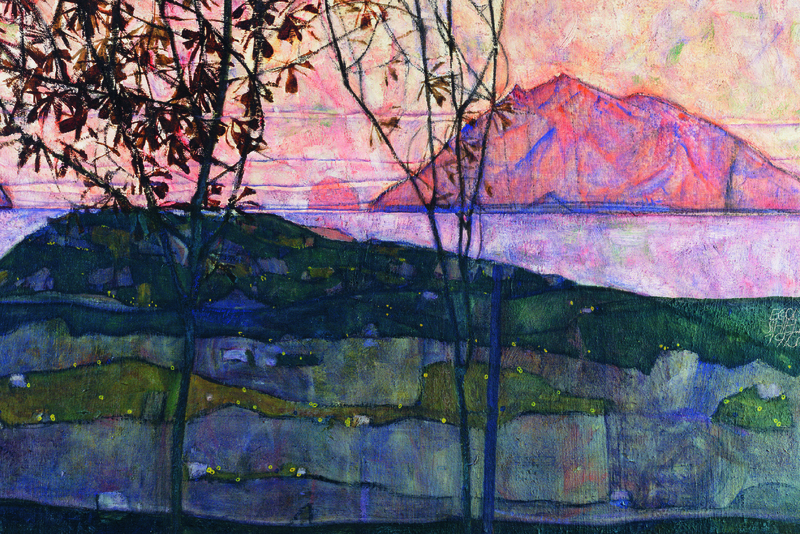 With Beauty and the Abyss, a program of special events, tours and exhibitions, the city is shining a light on Gustav Klimt, Egon Schiele, Otto Wagner, Koloman Moser and their contemporaries. The spirit of this era has long held appeal for me, and its details fascinate. I love the idea that, in his pioneering design and co-founding of the trendsetting Wiener Werkstätte – a studio of craftspeople whose aim it was to imbue everyday objects with high quality and aesthetic value – Moser was essentially the world’s first graphic designer. I love the Art Nouveau flourishes that Wagner – a visionary of modernist architecture and urban planning – stamped across the city in his metro stations and other buildings. And I love the sinuousness and sensuality of a gold-leafed Klimt painting: viewing The Kiss in the flesh, in all its dimensions, at the Belvedere is something very special. But for me, when I think of Viennese Modernism, I think of Schiele: the darkness and beauty he painted into each blunt edge and broken line. I could spend whole days in the Leopold Museum – home to the world’s largest Schiele collection – and almost do. The works here show the provocative artist’s trajectory from young Klimt protégé to self-possessed creator of raw, expressive and often sexually direct portraits. They include the beautiful and brooding land and townscapes for which he is less known, and the mature and melancholic imagery he painted not long before his death from Spanish flu at the age of just 28. What strikes me is how bold and alive each image appears now, still. While the key players of Viennese Modernism defined the movement in their own different ways, they were united in being daring and ahead of their time. They metabolised the energy of the day and turned it into timeless art. What was in the water back then? This question is best pondered over a Wiener Melange – half espresso, half hot frothy milk – at Café Museum. During the second half of the 19th century, Vienna experienced a phase of social and political upheaval that saw the city change and grow dramatically. In 1857, Emperor Franz Joseph I levelled the medieval city walls and ordered a grand boulevard – the Ringstrasse – to be built in their place, connecting the aristocratic centre to the suburbs. The dual monarchy of Austria-Hungary was established in 1867, drawing people from across its 15 nations to the capital, and further cultures were introduced by world’s fairs: the Vienna International Exposition of 1873 sparked a craze for Japonism that would influence the development of Art Nouveau. By the turn of the century, Vienna had transformed itself into a centre of thought and culture, and coffee houses were at its heart. Here, artists, architects, writers, physicians, intellectuals, musicians and more would argue, debate and cross-pollinate ideas. And if Vienna was the originator of hipster coffee culture, then Café Museum – frequented by the likes of Schiele, Klimt and Wagner – was ground zero. Originally designed by Loos in 1899 (it was his first significant commission, and has since been redesigned) part of its appeal lay in its proximity to the Secession Building. A two-minute walk from Café Museum, the Secession Building was created as an architectural manifesto for the Secessionists; an association – with Klimt as its first president – that had broken away from the conservatism of the Viennese art establishment. It was the first exhibition hall in Central Europe to be dedicated entirely to modern art and, with its striking gold cupola, caused a commotion when it was unveiled in 1898. “At the time it must have seemed like something completely alien had descended on the city,” says art historian and curator Christian Witt-Döring as we observe it from the street. “And so the Viennese said it looked like an Assyrian public toilet, or like the tomb of the Mahdi.” It still acts as a space for contemporary art, as well as Klimt’s somewhat outré Beethoven Frieze, and the motto emblazoned below the dome’s gold leafwork (written by the era’s preeminent art critic Ludwig Hevesi) resonates today: “To every age its art, to every art its freedom”. But for all that the artists and designers of Viennese Modernism scandalised and challenged conservative values at the time, they were “very much concerned with following a lost tradition,” Christian argues. “Their goal was the promotion of an individual artistic expression realised as a unique handcrafted object”; an approach that was somewhat old fashioned in a dawning era of industrial mass production. He considers a quote by composer Gustav Mahler: “Tradition is not the worship of ashes, but the preservation of fire”. Today you’ll find that fire in the fabric of the city’s many layers. It’s moments from the Secession in the atmospheric Naschmarkt: an Anthony Bourdain-endorsed food market with all the flavours of the Balkans that’s as hip as it is historic; it burns bright in Australian mezzo soprano Margaret Plummer, a full-time member of the Vienna State Opera who shares stories with us, straight off stage, over a late-night dinner at the Hotel Sacher’s Rote Bar; and it’s in the studios and stores of designers and artisans hidden from view of most visitors. It took Lucie Lamster Thury, a former New York fashion stylist, a little while to recalibrate from Manhattan speed to Vienna’s calmer pace of life, and to modulate her calorie intake. “I put on about 10 pounds in a day when I first got here”, she laughs, as we contemplate hot chocolate and warm apple strudel under the arched ceilings of Conditorei Sluka on Kärntner Strasse (like so many buildings in Vienna – cafe, gallery or otherwise – it looks like a palace). Now, she’s in her element guiding Shopping with Lucie! tours that shed light on what locals are doing and where they shop (and include an obligatory coffee house stop). 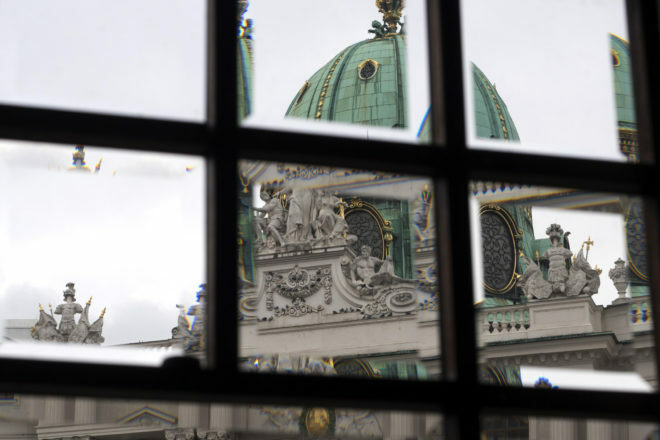 Her Beauty and the Abyss tour, focused on the city’s first district, has been tailored around Viennese Modernism and takes in “places that were around then and now,” she says. The Wiener Silber Manufactur (Vienna Silver Factory) and Österreichischen Werkstätten (Austrian workshop), for example, have direct links to Vienna’s early 1900s and are where you’ll find authentic modernist mementos: a set of cutlery reproduced from original designs by Secession and Wiener Werkstätte co-founder Josef Hoffmann; or textiles realised in a graphic Moser print originally created for the Wiener Werkstätte. Lucie’s range of tours highlight other sides of the city including the creative seventh district, with its concentration of cafes, bars and small designer shops; and the interesting fourth district, home to the Naschmarkt and its Saturday flea market, antique shops, quirky cafes and specialty food stores. I’ll come back to Vienna to experience more of these layers, in summertime – when the thing to do is drink heuriger wine in the vineyards of the Vienna Woods and dine out on the banks of the Danube. But for now it’s midwinter and we’re cosy in cafes, or we’re bundled up outside sipping glühwein at Christmas Markets. At night Vienna shines elegantly under constellations of white lights and by day it sparkles in the crisp winter sun. On one particularly perfect winter’s day, we drive west out of the inner city to the Church of St. Leopold, also known as the Kirche am Steinhof. An Art Nouveau masterpiece, it was designed by Otto Wagner and built between 1904 and 1907 as part of a reformist psychiatric hospital. Everything about it is considered: from the chandeliers with handles that enabled them to be pulled down and cleaned easily, to heaters and ventilation conceived for comfort and hygiene, and pews with rounded edges that wouldn’t hurt patients should they bump into them. But it also has walls made from white Carrara marble, colourful glass mosaics designed by Moser, avant-garde angels by Othmar Schimkowitz and a copper dome doused in gold foil. It wasn’t until the 1970s that Vienna’s modern art and architecture experienced an international rediscovery. While making our way between Wagner’s floral Majolica House and his austere but artful Austrian Postal Savings Bank days before, I’d asked Christian what the catalyst had been. “Postmodernism,” he replied simply. “For the postmodernists, the way to define Vienna is it’s the only culture where you’ll find the perfect harmony between the rational and the emotional.” His response describes how I feel at the Church of St. Leopold. Pragmatic it may be, but in this moment – in this light – it looks like the most beautiful building I’ve ever seen. 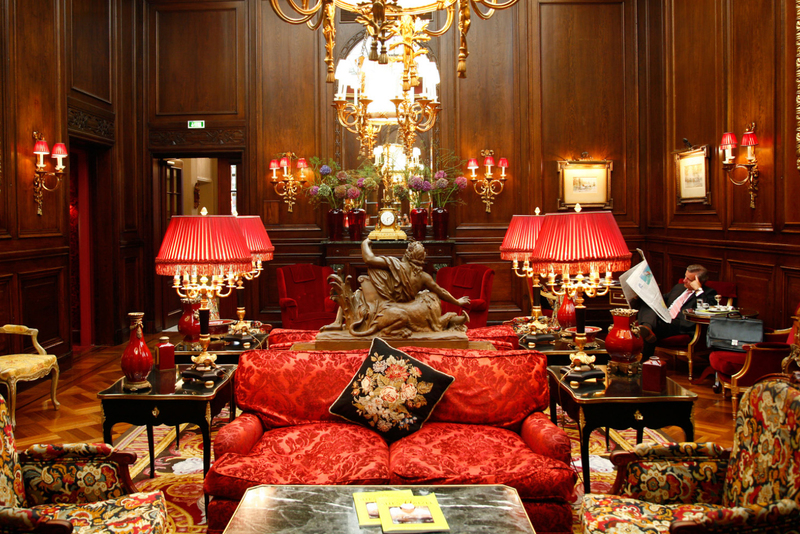 Hotel Sacher is a Viennese icon. Opulent, historic and home of the Sacher-Torte, it is located opposite the State Opera House. 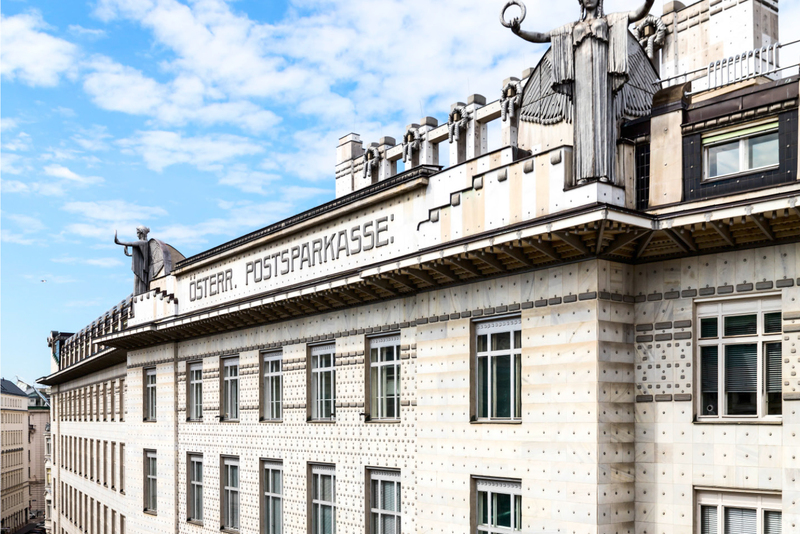 Hotel Topazz is a boutique offering in the first district inspired by Vienna’s modernists, most notably Koloman Moser. Restaurant Zum Schwarzes Kameel is another Viennese institution, serving classic fare. Dating back to 1618, it was redesigned in 1901 in Art Nouveau style. Labstelle is where elegant Vienna is given a contemporary twist, with stylish interior design and a creative, local produce-driven menu. Gmoakeller is a typical Viennese beisl – or bistro – and is big on both atmosphere and portions of authentic Austrian cuisine. Bitzinger Wurstelstand Albertina is the best place to try Vienna’s quintessential street food. A sausage stand of cult status, it’s located behind the opera house. For more on Vienna in 2018 and beyond and Viennese Modernism see wien.info and wienermoderne2018.info. PLUS we explore the depths of beautiful Italy in detail, explore tiny hotels in Portland, Oregon, discover what a short break in the Spice Islands looks like, travel into the golden age of Austria, and take a peek inside Japan's beautiful Kansai region - and much more!